I have been so keen to show you my last birthday pressie, it arrived yesterday and I have now photographed it so you can see. 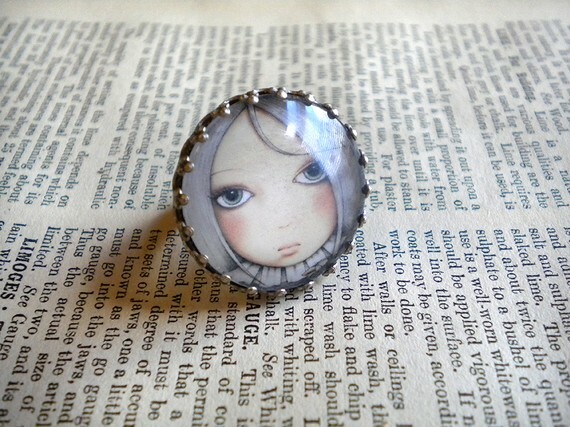 Well you know I am a fan of Leanne Ellis's work some of you may have some of her stamps or may have even purchased some of her recent digi stamps (scroll down for post with links) well my lovely hubby bought me this gorgeous ring! Thank you so very much Leanne! It will grace the pages of my books very soon after I have shown it to everyone! Back tomorrow with Little Musings, if I ever finally finish and this weeks musing is a must have you will see why tomorrow!!! It is beautiful and well done on your win. Wow both are gorgeous, and Congratulations on your win hun. Oh' this is Gorgeous Dazie a beautiful gift and also the book chum, congrats!!! on your win too! !